Let’s continue our analysis, as already mentioned in the previous blog, by comparing the Viro Made in Italy “Blocca catena” product and its copies produced in the Far East. Also in this case the results of the comparison confirm the predictions. On the left, the original Viro products in the salt spray machine before testing and on the right the imitations. On the left, the original Viro products in the salt spray machine after testing and on the right the imitations. Let’s focus or attention on the “Blocca catena” and its imitation. As can be seen, the only point that shows some signs of oxidation in the “Blocca catena” is the edge of the armour, which is not linked to the resistance of the product, whilst the outer armour and, above all, the internal mechanism, are free from corrosion. Blocca catena after testing in the salt spray machine. However, there are various small corrosion points in the copy, and in particular there is oxidisation precisely at the point where the key is inserted. The quantity may not seem very significant, but it is a sign of a much more serious corrosion of the internal mechanism. 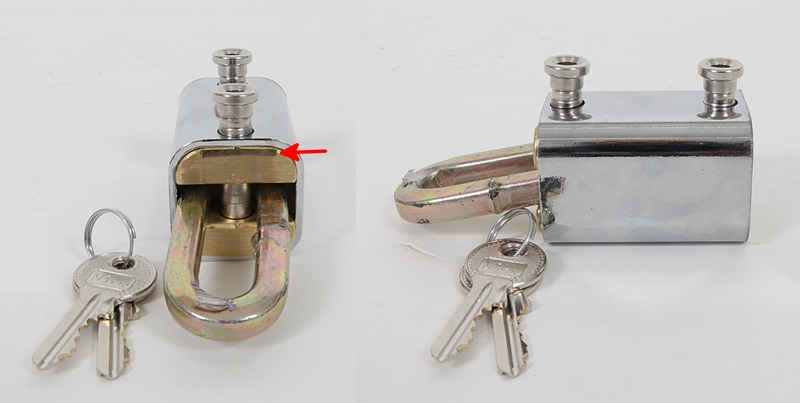 So much so that, as can be seen the short video below, whilst the original Viro product still works perfectly after the salt spray test, the copy is blocked; it is difficult to insert the key and it will not turn, even with the help of pliers. 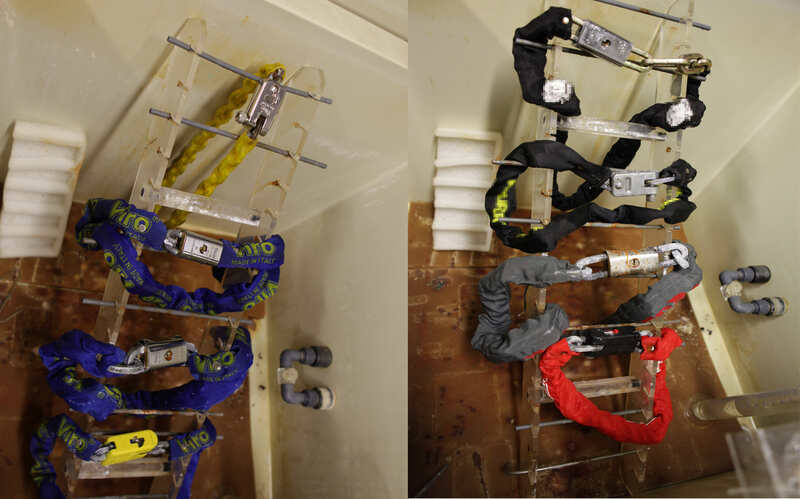 The second test we performed on our product and on the imitation is the attempt to cut the chain. We used a machine present in our test laboratory which, by using a mechanical arm, operates a hacksaw, and we tried to saw off a Made in Italy chain link and then one of the chain of the imitation product. 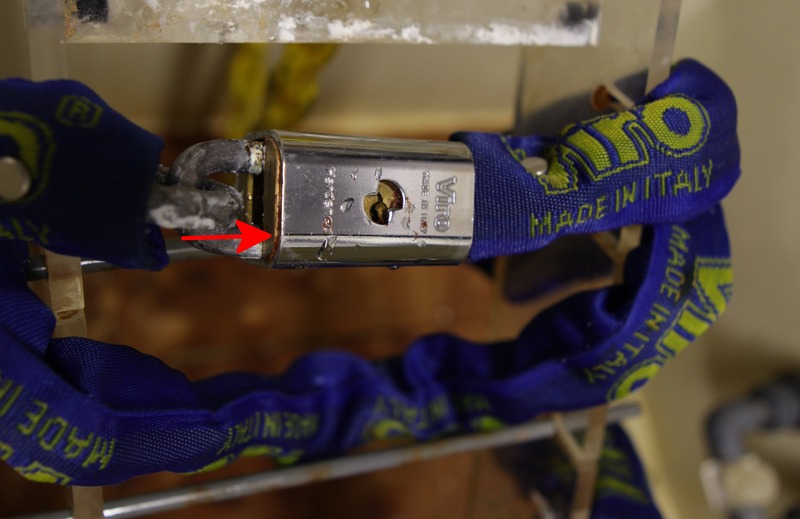 As you can see in the video below, the chain of the Viro product withstands the cutting with the saw, as it is tempered and case-hardened. On the contrary, the chain of the imitation product shows that it has been manufactured simply with iron which has not been heat treated, so it can be very easily cut with a hacksaw. This short video shows a comparison between the two chains after the chain cutting test. As repeatedly mentioned in several previous blogs, tempering and case-hardening are not sufficient conditions to be able to claim that the chain withstands any type of cutting. Cutters with long handles and rotating disks can be very dangerous for all chains. Therefore, in addition to a correct positioning of the chain (to keep it as high off the ground as possible), the size of the cross section of the links, which withstand the action of these cutting tools, must also increase in relation to the value of the asset to be protected and the risky nature of the environment where the asset itself is stored. In any case, the fundamental condition in order for the chains to be deemed appropriate for protecting bikes is that they have been subjected to a tempering and case-hardening process. 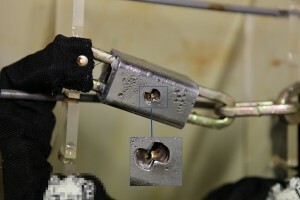 The third test we performed concerns the resistance of the padlocks themselves, that is, of the Viro “Blocca catena” and the imitation product. 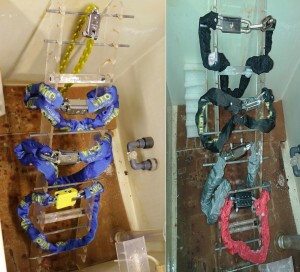 Again within the testing laboratory, we have inserted the products, using the same type of chain link, in a tool which reproduces the blows delivered from a height of 1 m, from the top downwards, with a weight of 3.05 kg as if it were being attacked with a hammer in an attempt to break the joint between the lock-bolt of the padlock and the chain. It can be seen that the “Blocca catena”, when subjected to 5 blows, remains completely intact, with just a slight marking, and remains perfectly operational, without even losing the head of the lock-bolt (which is designed for programmed breakage, so that, when trying to tear it from the body of the padlock, it breaks at a specific predetermined point, leaving the padlock closed and the remaining part of the lock-bolt inside the body, which cannot, therefore, be gripped). However, in the case of the imitation product, the lock-bolt is driven outwards after the 5 blows, allowing the escape of the chain link; this effect is due to the fact that the padlock body, which is made of zamak, has shattered. 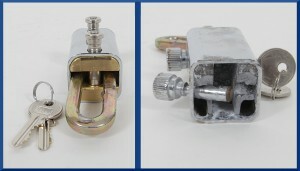 Comparison after testing resistance to blows on the “Blocca catena” and the copy. Summing up, we can confirm that after checking the materials and, even more so, after the strength tests, the imitations of the “Blocca catena” do not stand comparison with the original product. In effect, these copies are made with the aim of confusing users, by means of the similar appearance, who are seeking adequate protection for their bikes, but they do not offer any real defence.